Joseph A. Pompa passed away peacefully on Thursday, November 29, 2018 at the age of 92. Joseph was predeceased by his beloved wife, Helen Pompa of 50 years, his son, Joseph E. Pompa, his brother, Vincent C. Pompa and his sister, Fortunda Pompa Wiese. A life long resident of Staten Island, born on January 16, 1926. Joseph is survived by his loving son James V. Pompa and his daughter in law, Margaret Mary Pompa. A stepbrother, Joseph Guido. Also survivng are his five loving grandchildren, Joseph E. Pompa, Geana Marie Luisi, Tonianne Violetta, James V. Pompa Jr. and Patrice Pompa as well as four wonderful great grand children, Stephen Violetta, James Luisi, Leanna Luisi and Joseph Pompa. 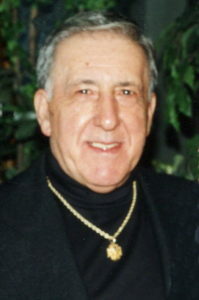 Joseph A. Pompa worked for 25 years at Rheems Manufacturing company in Linden, New Jersey as well as Staten Island Toyota and Villa Marin. He was an avid lover of the New York Yankees and the New York Giants. He coached little league baseball at West Shore Little League for over 30 years and he was also a parishioner of St. Roch’s Church where he attended mass weekly. He will be truly missed by all who knew him. Jimmy my deepest sympathy for you and your family. Im so sorry to hear about your fathers passing. The caring and experienced professionals at Cherubini McInerney Funeral Home are here to support you through this difficult time. We offer a range of personalized services to suit your family’s wishes and requirements. You can count on us to help you plan a personal, lasting tribute to your loved one. And, we’ll carefully guide you through the many decisions that must be made during this challenging time, whether a burial or cremation is preferred. Copyright © 2019 Cherubini McInerney Funeral Home . All rights reserved.